Maize (called corn in some countries) is Zea mays, a member of the grass family Poaceae. It is a cereal grain which was first grown by people in ancient Central America. It is now the third most important cereal crop in the world. However, little of this maize is eaten directly by humans. Most is used to make corn ethanol, animal feed and other maize products, such as corn starch and corn syrup. 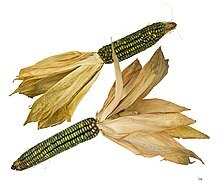 Maize is a leafy stalk whose kernels have seeds inside. It is an angiosperm, which means that its seeds are enclosed inside a fruit or shell. It is has long been a staple food by many people in Mexico, Central and South America and parts of Africa. In Europe and the rest of North America, maize is grown mostly for use as animal feed. In Canada and the United States, maize is commonly referred to as "corn". Centuries of cross breeding have produced larger plants, and specialized varieties. Corn has become an important ingredient in American foods through the use of corn starch. People have long eaten sweet corn and popcorn with little processing, and other kinds after processing into flour for making cornbread, tortillas, and other artificial foods. Maize has been a fruitful model organism for research in genetics for many years: see Barbara McClintock. Research has shown that artificial selection developed maize from a Mexican plant called Teosinte. There are five species and many subspecies in the genus. They are all plants similar to the cultivated maize, with less developed cobs. The wild ones are sometimes called teosintes, and they are all native to Mesoamerica. ↑ Doebley J. 2004. The genetics of maize evolution. Annual Reviews of Genetics 38, 37–59. This page was last changed on 23 December 2018, at 18:59.